Any two companies, one registered in Israel and the other in the U.S., may jointly apply for BIRD support as long as they have the combined capability and infrastructure to define, develop, manufacture, sell and support an innovative product or service, referred to as “the Product.” The two partnering companies are collectively referred to as “the Proposer.” One key criterion is that each company shall have the demonstrated ability to carry out its part of the Product’s joint development program, referred to as “the Project,” as well as its part in the commercialization. Another key criterion is that the nature of the business relationship between the two companies is that of sharing; both in the Product’s development program and in the revenue derived from its commercialization.Click here to read about BIRD’s funding policy for related companies. The jointly developed product(s) or service(s) must have significant technological innovation. Ideally, one or both companies shall possess intellectual property rights to the technology to be developed and to the product commercialization. The Product should target an attractive and growing market that is geographically non-specific, and is familiar to and serviced by at least one of the two partnering companies. The Project is defined as the scope and duration of the development program undertaken jointly by both companies, at the end of which the Product should be close to market-ready. All activities required for subsequent commercial manufacturing, specification, and market introduction should be described in the Project Proposal including beta-site testing, regulatory approvals and test marketing. Project start date may be as early as the first of the month in which the final Project proposal is submitted jointly by the companies, and Project duration may be as long as 3-4 years, if deemed necessary for reaching commercial readiness. The U.S. company and the Israeli company are collectively referred to as “the Proposer.” Both companies should have the necessary operations required for the Project in their respective countries, whether R&D, manufacturing or marketing. The two companies should have the combined, proven capability and infrastructure to define, develop, manufacture, sell and support the Product defined by the Project. Both partners should contribute and share their technological expertise and intellectual property in execution of the joint development program, but their respective contributions do not necessarily have to be equivalent. Nevertheless, the task assignments should be divided in such a way that neither partner’s portion in the combined budget is less than 30%. Manufacturing responsibilities of the Product can be divided between the companies as they see fit, and can be performed by subcontractors in any geographical location. Marketing and sales support of the Product can be divided between the project partners. However, at least one partner should have market presence, as well as a proven track record in marketing and infrastructure, to successfully realize, upon product commercialization, the bulk of the sales projections indicated in the proposal. The Project Budget is estimated by the Proposer and is submitted as part of the project proposal in the grant application process. The budget that BIRD recognizes includes practically all development expenses to be incurred during the course of the Project, including direct labor and its associated overhead, materials, subcontractors, consultants, travel, depreciation (33% per year) on new or used equipment employed, and marketing expenses related to the development effort. The budget is prepared and submitted by the Israeli company ($X in the diagram) and the U.S. company ($Y), and covers the entire project duration. 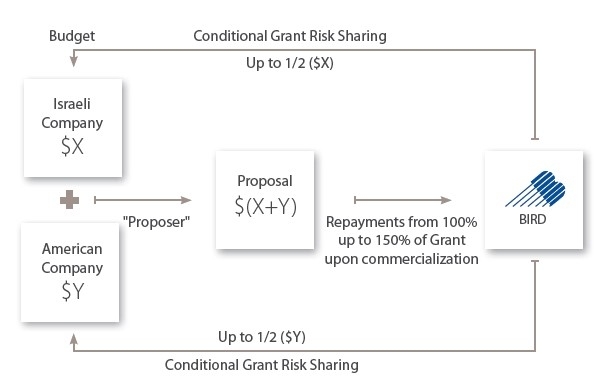 BIRD will cost-share the joint development by extending to the Proposer a conditional grant totaling up to 50% of the Project Budget (X+Y in the diagram). Each partner directly receives the portion of the total grant that is relative to its share in the budget. Payments are made after receipt and approval of a joint technical report and a separate fiscal report submitted by each partner at the end of each segment (generally every 6 months). These reports cover the development progress and the actual expenses incurred during the segment. the date used is the original termination date. For the period extending from Project start, up to a full year after Project completion (first year of product commercialization), the repayment amount due is the actual cumulative sum granted by BIRD to the Proposer, linked to the U.S. Consumer Price Index (CPI). The repayment sum due does not increase beyond the 5th year after Project completion, so the maximum repayment obligation that the Proposer can ever assume is 150% of the total sum granted by BIRD, linked to the CPI. In addition, BIRD will accept early retirement of the Conditional Grant, if so desired by the Proposer. If the commercialization of the Product is unsuccessful, and no sales revenue is generated, whether due to technological or marketing failure, BIRD will not seek repayment of the Conditional Grant. Thus, BIRD participates with the Proposer in the risk of an unsuccessful product development investment. By providing a conditional grant, BIRD cost-shares up to 50% of a Project’s development expenses. BIRD is entitled to repayments up to a maximum of 150% of this Conditional Grant based on sales revenues derived from the Project. If a Project fails, BIRD will claim no repayments. Therefore, BIRD is sharing the risk with the Project partners. BIRD acquires neither equity nor any rights to intellectual property in BIRD-funded Projects. 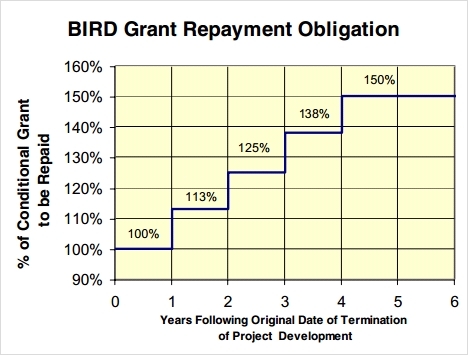 BIRD’s Conditional Grant is a form of off-balance sheet financing. Grant payments are usually recorded as a reduction of R&D expenses, and grant repayments are recorded as a royalty expense. Because both transactions are P&L items and the repayment obligation is not recorded as a liability, they do not have any impact on the balance sheet. In addition, repayments are considered pre-tax expenses. This R&D leveraging instrument has proven popular with public and pre-public companies. BIRD is not involved in formulating the nature of the relationship between the partnering companies. Likewise, the precise conditions and terms of this relationship are not subject to BIRD approval. Project proposals submitted to BIRD are subject to a confidential review by qualified and experienced experts from the US National Institute of Standards and Technology (NIST) and from the Israel Innovation Authority. Their professional recommendations, together with BIRD’s familiarity with the participating companies, are further endorsements of the decision to undertake the joint venture.